Well, Well, who would have guessed it? 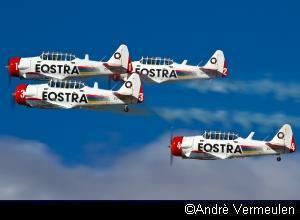 ... Yep you have it - the day before the airshow rumor has it that it was a nice warm wintry day in Bloemfontein. Yeah right, could have fooled me. 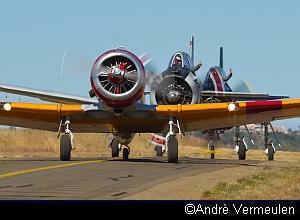 Drove in from Johannesburg early Saturday morning for what was going to be an excellent display of Warbirds in warm sunny weather. Pity no-one knows why this cold wind decided to make its appearance, or wait it's Bloemfontein! From early morning the wind was blowing with the windsock at 90 degrees to the ground, and Oh who left the refrigerator door open overnight as it was cold, thought it must have snowed somewhere. Met up with my friends from the media and spent some time talking to Brian Emmenis, who with his team from Capital Sounds had set up to entertain the crowd at the airshow for the day. Francois Hanekom was the Safety Director for the day and once again he did an excellent job in making sure everyone operated safely and as expected. The Team from ATNS had the coldest workstation for the day and they handled the event professionally. Soon after we set up the first arrivals for the day, a PPHU EKOLOT JK-05 JUNIOR, with its Rotax 912 ULS engine fighting with a gusting but near perfect headwind for landing. Some of the early morning arrivals were the North American T28B (Trojan), North American T28A (Fennec), Harvard with Larry and Jason Beamish, the Impala Mk1, Mustang Sally and the L39 all gleaming and spotless, ready for the show. 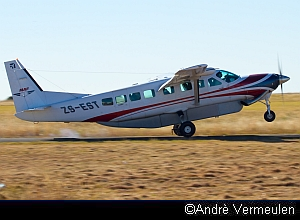 One of the arrivals a Cessna 208B Caravan landed and I was amazed at how high his nose attitude was during the flare and touchdown just past the numbers. Springbok Classic Air brought some passengers from Rand Airport to the show in the McDonnell Douglas DC-3, with none other than Flippie Vermeulen in command; it was a tight squeeze on the taxiways. I should have used the opportunity to fly down in it as well but alas it was not to be. My favorite arrival was the classic Boeing Stearman A75 trainer ZS-LPL, with a stunning paint scheme and a warmly dressed pilot who must have been wishing he had been flying an aircraft with a canopy. To the delight of the now growing crowd the arrival of the Eqstra Harvards, with Scully Levin leading the formation was a grand affair - pilots waving to the crowd and the crowd showing their appreciation. First on the display was the Chevrolet Skydivers, who managed to impress with various maneuvers and impressive landings in some tricky conditions. ZU-JET flown by Dave Mandell was the first aircraft to do a display with a few high-speed passes and barrel rolls, followed by the impressive slow pass in the dirty configuration. 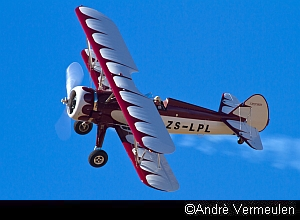 Again my favorite aircraft the Boeing Stearman piloted by Robbie Beaumont showed how a Stearman should be flown with some graceful loops and rolls, a real pleasure to watch. 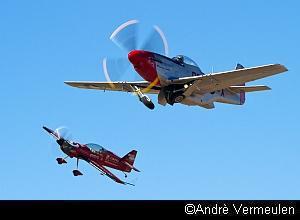 Mike Weingartz flew the Impala Mk I ZU-IMP. The tail slide and fuel jettison was an impressive sight against a brilliant blue sky. 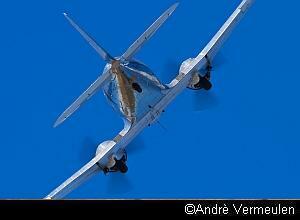 The Springbok Classic Air DC-3 was next with Flippie Vermeulen flying a graceful display. Now that's how one should fly a DC-3, with steep turns, figure eights and a few straight and level passes. Impressive. One of only two non-warbird displays was that of 2 MX2's flown by Nigel Hopkins and Mark Hensman and 2 Cirrus SR-22's, one of which was flown by Scott Ternent, the other by Deon Wentzel. It was a very tight four-ship performance. The two MX2's broke away and we were treated to some close formation flying by the two SR-22's. As they broke away Nigel and Mark did some formation aerobatics followed by their own individual sequences. Awesome!! A surprise was when Nigel who seemed to approach for a low level fly past aligned and formatted on the P51 Mustang which had just become airborne after a tailwind take-off. Nigel inverted the MX2 and flew above the P51 with Menno Parsons in command, an impressive maneuver and great start to the P51's display. In all over 15,000 Mustangs of all types were built between 1940 and 1945. We have two privately owned airworthy P-51's in South Africa, with another on static display at the SAAF Museum at Swartkops Air Force Base in Pretoria. The Vampire came from Braam Fischer International Airport; most of the crew was stationed there, as it was just not possible to accommodate the Vampire at Tempe. Glen Warden did an excellent job of giving us an all-over view of this beautifully maintained aircraft with high speed passes, and flew in clean and dirty configuration. We currently have 2 flying Vampires in South Africa, and a third one is almost ready to go. Just brute force as the North American T28 B and a T28 A Fennec joined up with a North American Harvard for a great three-ship display. 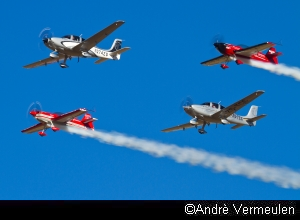 The Harvard broke formation for an individual display followed by some formation and solo flights by the T28 pilots, Pierre Gouws and John Wright. 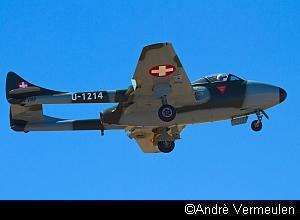 The T28A Fennec is one of 128 modified T28's; these modifications were done by Sud-Aviation in France. More noise as the Eqstra Flying Lions roared into the box, with Sully and Ellis Levin, Arnie Meneghelli and Sean Thackwray. Once again the team showed their skill with tight formation flying, graceful aerobatics and the amazing sound of four Harvard's in formation. 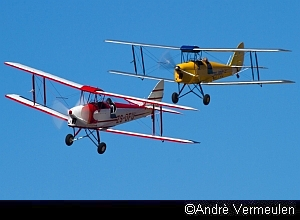 From high speed to slow and I mean slow especially in the wind were the two De Havilland DH82 Tigermoths flown by Johnny Smith and Harry De Villiers. These training aircraft were used extensively for training in World War 2 and a total of 38 countries used them as trainers for their air forces. Glad I was on the ground as the cold wind never let up and I can just imagine how cold it was in the open cockpits of these Tigermoths. When the Tigers turned down wind, it was a completely different sight with them picking up some impressive speed and doing a low- level high-speed fly past. The other non-warbird display for the day was that of the RV7 flown by Martin Venn, sponsored by Mooney Aviation. 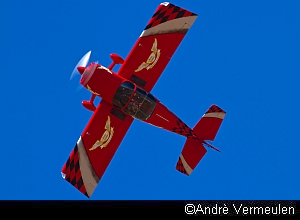 An impressive display but for me the RV7 does not do loops and barrel rolls, and the aircraft just does not look right with it's short wings and scrunched up look, but this should not distract us from a great display. The Chevrolet guys decided that its time to race Nigel in the MX2, well the Corvette tried and lost but the car was a great distraction before the surprise of the day. Advertised on the program was the T-2 Buckeye but it went technical so what were we waiting for? 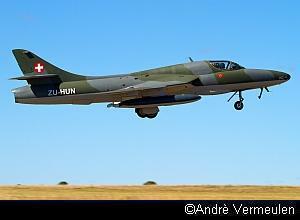 In she came - the Hawker Hunter, low level but what a beauty, sporting an immaculate Swiss livery. Although only allowed to do a flat display the aircraft managed to keep many an eye fixed to the skies. After the display the Hunter was cleared in to Bloemfontein airport; low level over Bloemfontein it must have turned a few heads. The DC-3 did a few flips whilst everyone took a break. The rest of the day was followed by pretty much the same displays except for the Hunter and Vampire. The Bloemfontein crowd was awesome braving the cold wind and dust to watch some magical aerobatics, as presented by the many sponsors. This was a great display of privately owned warbirds. Thanks to Kassie Kasselman and his team for putting together a great show, the owners of all these aircraft who brought them in for the show and the Sponsors Chevrolet, Remax, Capital Sounds and Imperial. Well lets see what Tempe brings to the party next time, I can't wait.